Click Messages on the Ensemble View menu. Click Go to Message Viewer at the top of the Messages tab on the Production Configuration page. ID  The ID of the message. See Message Basics, in the first chapter. Time Created  The message creation time stamp. See Invocation Style and Message Time Stamps, in the first chapter. Session  The ID of the session associated with this message. See Sessions, in the first chapter. You can select the Session number in any row of the table to see a visual trace of the message object through the production. Status  Indicates the status of the message. See Message Status, in the first chapter. Error  Provides a quick overview of the results returned by the message to the business host that sent it. OK means normal behavior; Retry means the message experienced a failure but the business host that sent it is configured to retry the failed message. Error means an error was reported somewhere in the activity. Inactive means that the business host that sent the message has been idle for longer than its Inactivity Timeout setting, and may require diagnostic action. Source  The business host that sent the message. Target  The business host to which the message was sent. Red The message encountered an error. Green The message marks the start of a session. Silver The message arrived after a timeout expired and is marked as discarded. Orange The message is suspended. White and pale tan, in alternating rows These messages are OK or are queued. You can display the next page of messages. To do so, click Next. You can display more messages. To do so, select a larger value for Page Size and click Search again. The default is 100 messages. You can display the previous page of messages. To do so, click Previous. You can change how the messages are sorted. To do so, click a different value for Sort Order. Also use Time Format to specify whether to show only the time or the complete time with the date. The default is Time Only. The read-only Page field indicates which page of the list is being displayed. Access this page as described in previously. Use the Basic Criteria and Extended Criteria areas to specify filter criteria, as described in the following sections. Use the Saved Searches area to retrieve a previously saved set of filter criteria. To do so, select a value from the drop-down list and then click the check mark. Click Search. The page is redisplayed with a list of messages that match your filter criteria. If the search has not yet completed, you can interrupt it by clicking Cancel. Or click Reset to restore the default criteria. If more matches are found than can be displayed, the Next button is active, and you can use that. Or, to display more data, select a larger value for Page Size and click Search again. Or adjust your filter criteria to narrow the search. Optionally click Save or Save As to save the search criteria for later reuse. Ensemble then displays a field in which you provide a name for the search criteria. Enter a value and click the check mark. This operation overwrites any previously saved criteria with the same name. To delete a saved search, click its name in the Saved Searches list and then click the red X. Status  Select a value from the drop-down list. See Message Status, in the first chapter. Type  Select a value from the drop-down list: Session Start, Request, Response, or All (the default). Start Time  Enter the earliest desired message creation time stamp. See Invocation Style and Message Time Stamps, in the first chapter. Start Id  Enter the lowest desired message ID. End Time  Enter the latest desired message creation time stamp. End Id  Enter the highest desired message ID. Source  The business host that sent the message. Choose from the list. Target  The business host that is the target of the message. Choose from the list. If you are using the Message Bank Viewer, there is an additional filter that restricts the search to a single Message Bank client. See Using the Enterprise Message Bank. The Extended Criteria area enables you to filter the displayed messages by extremely specific criteria. An advanced filter consists of one or more conditions, combined with the logical operators AND and OR. Each condition can use any information contained in the messages, comparison operators from a rich set, and your arbitrary expressions. Only messages that meet all the combined conditions are displayed. To add a criterion, click Add Criterion. See the first subsection for details. When you are satisfied with your selections, click Search. The Message Viewer page displays the list of messages that match all your filter criteria. Enable Criterion  Select to enable this search. Criterion Type  Choose a value from the list. See the next subsection. Class  Click a class name from the list. See the Class subsection. Conditions  Allows you to specify fields and values for your logical statement. See the Conditions subsection. Display Values  Allows you to specify additional values to display in the table. Your chosen values are displayed on the right side of the table. Click OK to save this criterion and add it to the Extended Criteria list. For Criterion Type, select a value from the drop-down list, if applicable. The following table lists the choices and how they affect your subsequent choices in the Class and Conditions fields. Body Property Properties of a standard Ensemble message body object. Header Field Fields in a standard Ensemble message header object. SearchTable Field Entries in a search table class that you have defined in this Ensemble namespace. A search table class is a specialized tool that you create to work with virtual documents. VDoc Segment Field Fields in a virtual document message segment. Identify the standard and the segment of interest. Ensemble then prompts you to choose from a list of fields in that segment. VDoc Property Path Fields in a virtual document message segment. Identify the standard and then enter a virtual property path that identifies a message segment and field that is valid for that standard. For background information about the VDoc fields in the Extended Criteria interface, see Ensemble Virtual Documents. You do not need to use these fields unless your production routes some type of virtual document. Body Property Choose from all the message classes in this namespace. SearchTable Field Choose from all the search table classes in this namespace. VDoc Segment Field Choose from all the virtual document classes in this namespace. VDoc Property Path Choose from all the virtual document classes in this namespace. For the first cell, select a value from the drop-down list, which includes all choices appropriate for this context. For further instructions, see the first table below. For the second cell, select a comparison operator from the drop-down list. See the second table below. In the third cell, type the literal string that you intend to match using the selected operator. Do not use double quotes around the string. Choices in the Conditions panel vary according to your choice of Type. The following table describes the choices. Body Property Choose from all the properties in the Class Name message class. SearchTable Field Choose from all the search table entries defined in the Class Name search table class. For HL7, you can type a numeric references if you prefer them to names, for example , [18.1], or 2.3.1:[3().1]. You may edit out the category reference and colon prefix, but keep the square brackets and their contents intact. Square brackets differ from curly brackets in that square brackets enclose a segment:field combination that does not require you to identify its containing message structure. 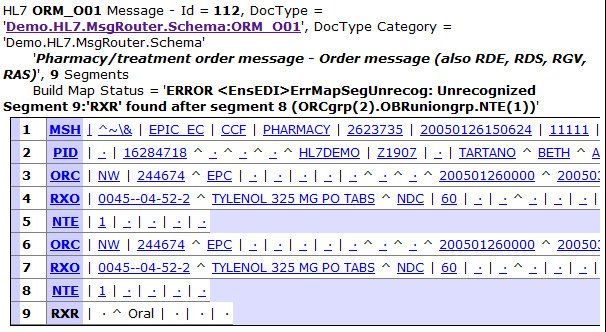 In the example above, Ensemble matches any message structure in the 2.3.1 schema category that contains a PID segment with a PatientAddress().city field . Instead of selecting options to fill the left-hand Conditions field, you can type a virtual property path into the field, as long as you are careful to use the correct syntax. Curly bracket syntax requires a specific message structure, such as ADT_A06, to be identified. The comparison operator between the two values in a Conditions statement can be any one of the following. = Equal to the value on the right. != Not equal to the value on the right. > Greater than the value to the right of the operator. >= Greater than or equal to the value to the right. < Less than the value to the right. Less than or equal to the value to the right. If a condition >, >=, <, or <= involves strings, they are sorted alphabetically to determine the result. Symbols and numbers sort before alphabetic characters. A string that contains the substring to the right. The Contains operator is case-sensitive (except possibly within search table fields). If the value at left is Hollywood, California and the value at right is od, Ca, there is a match, but a value of Wood does not match. The Contains operator might or might not be case-sensitive in search table fields, depending on the implementation of a particular search table class. DoesNotContain A string that does not contain the substring at right. DoesNotMatch A string that does not match the pattern in the string specified to the right, which uses syntax suitable for the ? pattern matching operator in ObjectScript. For details, see Pattern Matching in the chapter Operators and Expressions of Using Caché ObjectScript. In Identical to one of the items in the comma-delimited string at right. NotIn Identical to none of the items in the comma-delimited string at right. StartsWith A string that starts with the substring at right. DoesNotStartWith A string that does not start with the substring at right. A string that matches the pattern in the substring specified to the right, according to the rules for the LIKE predicate in SQL. Matching for the Like and NotLike condition may be summarized as follows: The character _ matches any single character, and the character % matches any sequence of zero or more characters. Thus, if the value at left contains the pattern %Com_ and the selected operator is Like, values of TransCom1 and UltraCom2 match, but values of UltraCom17 and Foxcom8 do not match. A string that matches the pattern in the string specified to the right, which uses syntax suitable for the ? pattern matching operator in ObjectScript. For details, see Pattern Matching in the chapter Operators and Expressions of Using Caché ObjectScript. NotLike A string that does not match the pattern in the substring specified to the right, according to the rules for the LIKE predicate in SQL. InFile Found in the text file whose full pathname is specified to the right. NotInFile Not found in the text file whose full pathname is specified to the right. When Ensemble indexes virtual documents (thus adding to the search tables), it replaces any vertical bar (|) with a plus sign (+). Take this into consideration when you use the search table to search for content. For example, to search for a message that contains my|string, use my+string as the search criterion. If you have multiple items in the Extended Criteria section, you can click the up-arrow and down-arrow icons to adjust their order. To edit an item, click the edit button for that item. To delete an item, click X.
Header  Displays the fields in the message header. Body  Displays the fields in the message body. Contents  Displays contents of the message body in an appropriate format. Trace  Displays a small visual trace of the message and related messages through the production. To see the larger version (the Visual Trace page), click View Full Trace. The following subsections describe the Header, Body, and Contents tabs. The Trace tab displays a subset of the data and options that you see on the larger Visual Trace page. The Visual Trace page is described in the next section. <ObjectId>  The ID of the message header (and also the message ID; see Message Basics, in the first chapter). TargetConfigName  The name of the business host that is intended to receive the message. Type  The message type, Request or Response. Invocation  Indicates how the message was sent. See Invocation Style and Message Time Stamps, in the first chapter. CorrespondingMessageId  For a request message, this field contains the message ID of the corresponding response (if any) or it is blank. For a response message, this field contains the message ID of the corresponding request. SessionId  The ID of the session associated with this message. See Sessions, in the first chapter. SourceConfigName  The business host that sent the message. SourceBusinessType  BusinessService, BusinessProcess, BusinessOperation, or Unknown. TargetBusinessType  BusinessService, BusinessProcess, BusinessOperation, or Unknown. BusinessProcessId  Every business process that gets executed has an instance and this is the object ID of that instance. If the message is a request, this field identifies the business process in whose context the message was created (sender). If the message is a response, this field identifies the business process to which it is being returned (receiver). This field is empty in various circumstances, for example if an error occurred. If this is a name, it identifies a public queue, such as Ens.Actor. If this is a number, it identifies the job ID associated with the private queue of a business host. 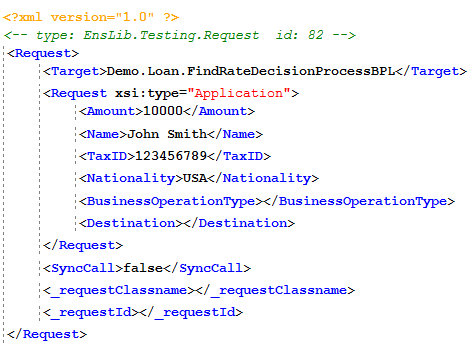 The ReturnQueueId value is listed even if there is no response expected or needed for a particular request message type. MessageBodyClassName  The class name for the message body. MessageBodyId  The ID for the message body. This field matches the <ObjectId> field in the Message Body table. Description  A text description of the message. The Ensemble Business Process Language (BPL) provides text in this field automatically, based on the type of BPL activity that generated the message. SuperSession  The ID for messages sent via HTTP from one production to another. For details, see SendSuperSession in Using HTTP Adapters with Ensemble. Resent  Indicates whether this is a resent message. 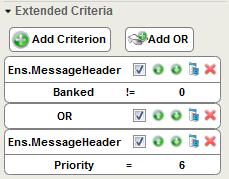 Priority  The priority of the message relative to others in the queue, as assigned by the Ensemble messaging engine. See Message Priority, in the first chapter. TimeCreated  The message creation time stamp. See Invocation Style and Message Time Stamps, in the first chapter. TimeProcessed  The message usage time stamp. Ensemble sets this field when the message is taken off of the queue but then resets it to the current time while the message is being processed. Typically, for a completed message, it represents the time that the message processing was completed. IsError?  The value 1 means that the message encountered an error. The value 0 means the message did not encounter any errors. ErrorStatus  If IsError? is 1, then this is the text associated with the error. When IsError? is 0, ErrorStatus is the string OK. Banked  Indicates whether or not this message is part of a message bank. The message body class name above the list of fields. <ObjectId>  The object identifier for the message body. This field matches the MessageBodyId field in the Header tab. The name and value of each property in the Message Type class. If the message body is any other type, there are no additional fields in the display. The Contents tab displays formatted contents of the message body. The segment number on a white background: 1, 2, 3, etc. The segment name on a shaded background: MSH, PID, etc. If you hover the cursor over a segment name in the shaded column, a tooltip describes the purpose of the message segment. The field contents and separator characters as provided in the message. If you hover the cursor over a field in this display, a tooltip provides syntax information that a developer can use to access fields within the message body from Ensemble data transformations and routing rules. To view all the contents of large virtual document, it may be necessary to drag the bottom scroll bar far to the right. To view the message in a wider display, click the View Full Contents link or the View Raw Contents link. View Full Contents displays the message formatted by fields and View Raw Contents displays the unprocessed message contents, which can easily be copied and pasted into a text editor. For background information, see Ensemble Virtual Documents. Or see the book for a specific kind of virtual document. 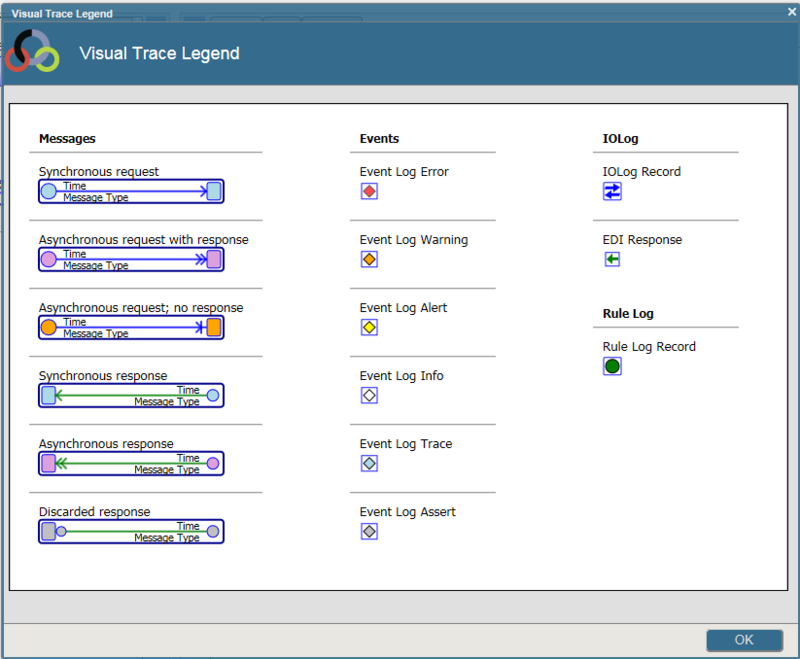 Click the Trace tab, which displays a small version of the trace. The left area of the Visual Trace page displays a visual representation of message activity, with one column for each business host that handles the message. The business hosts are grouped into business services, business processes, and business operations. When you view calls with this tool, synchronous calls from long-running business processes are portrayed as if they were asynchronous. This does not change the fact that the calls are actually synchronous. It is a side effect of the internal tracking mechanism that Ensemble uses to free system resources while it is waiting for a synchronous call to return. The source item is marked with a circle; this is the item that sends the message. The target item is marked with a rounded rectangle. The arrow points to this item, away from the source item. In both cases, you can read the name of the business host at the top of the column. A number in square brackets outside the box on left is the message identifier. A date and time within the box above the arrow indicates the message creation time stamp. See Invocation Style and Message Time Stamps, in the first chapter. The arrow is displayed in color. Normal request message arrows are blue; responses are green. If a message encountered an error, its arrow is red. The text below the arrow is the message name. Additional lines indicate when a given business host receives and later sends a message. All preceding messages with the target set to the source of the selected message. If a request message is selected, the corresponding response message. If a response message is selected, the corresponding request message. If an ACK or IOLog message is selected, the corresponding request or reply. To filter for all messages with a specific component as either the source or target of the messageselect the column for the component and then select Host from the Apply Filter drop-down menu. This selection limits the messages to those having either a source or target of the selected component. To filter for all messages having the same source and target as a specific messageselect the message and then select Host from the Apply Filter drop-down menu. This selection limits the messages to those that have both the same source and same target as the selected message. Once you have applied a filter, the Apply Filter label changes to Reapply Filter. If you change the selection of the value of the drop-down menu, you must select Reapply Filter to change filters. If there are more messages than will display on a page, you can use the Items per page drop-down to control the number of items displayed. You can either use the Go to items drop-down or the Previous Page and Next Page links to scroll through the pages. If a message is sent out from an outbound HTTP adapter to another Ensemble namespace, the incoming message is assigned a new SessionID. If you want to associate the related messages across namespaces, you can use the SendSuperSession setting. If this setting is specified on an outbound HTTP adapter, the adapter sets the SuperSession property in the HTTP header. This header property is preserved through the incoming HTTP adapter and preserved throughout the Ensemble production. For details, see SendSuperSession in Using HTTP Adapters with Ensemble. Select the messages by selecting the check boxes in the left column. Or filter the display appropriately and then click the check box at the top of the left column. If you need to edit messages before resending them, then select a single message. You cannot use the Edit and Resend option (shown later) if you select multiple messages on this page. More messages match your search criteria than appear here. If you want to resend all the messages that match your criteria, including those not shown on this page, click OK. To resend only your selected messages, click Cancel. Click OK to continue with all the selected messages. Click Cancel to continue with only the selected messages that were visible on the first page. In either case, you can later cancel the action. Session  The session to which each message belongs. 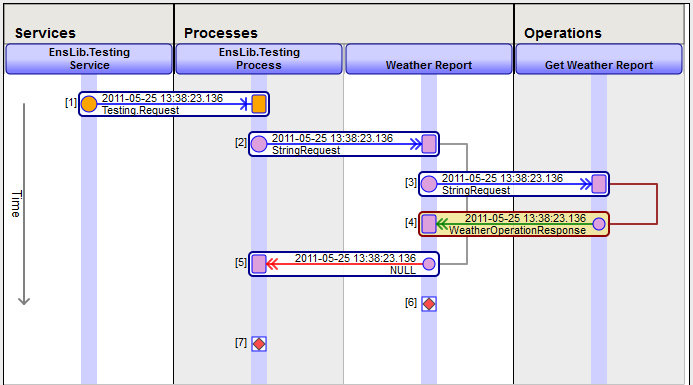 Click this to view the visual trace of the primary message object through the production. See Sessions, in the first chapter. Header  The ID for the message header (also the message ID). Click this to view the visual trace of this specific message. See Message Basics, in the first chapter. Msg Body  The ID for the message body. Click this to view the message contents. Created  The message creation time stamp. See Invocation Style and Message Time Stamps, in the first chapter. Target  The business host that was intended to receive the message. This field also indicates if the production target is not running; note that you cannot resend a message if the intended target is not running. Click this to see the contents of the target’s message queue. If you selected more than 1000 messages, only the first 1000 are shown, but the page indicates the total number that you selected. Optionally select a new target business host. To do so, select a value for New target. Optionally select Resubmit at head of queue. If you do so, Ensemble places the resent message at the front of its target queue. This helps to preserve FIFO (first in, first out) processing when the order of messages is important. Cancel  To cancel this action. Resend  To resend the message or messages as specified. Edit and Resend  To edit the message and resend it as specified. See the subsection for details. When you resend multiple messages, Ensemble resends them in order by age, starting with the oldest messages. When you resend the messages, the page is redisplayed with an additional Resend Status column. Any status other than OK indicates that the resend operation failed. A resent message retains the same Session identifier and transmits the same message body, but acquires a new message header (with a new, unique ID) to mark its additional trip through the production. The visual trace includes both the original message transmission and any resend operations that involve the same message. The description in the message header contains text indicating this message has been resent; the description includes the original along with any subsequent header object identifiers. When you select one message to resend from the Ensemble Message Viewer page, you have the option to edit the body of the message before resending it. Click Edit then Resend to display the Ensemble Resend Editor page. Use the entry fields to update the message body data. The fields vary depending on the message. If the message has no properties, none are displayed. If you are editing a virtual document message, you can edit data in the message content and also edit object properties in the box below the content box. Click Resend to send a new copy of the message header with your edited message body to the target. After a successful resend, the page refreshes with text indicating the new Header and Msg Body identifiers. Click Trace to see the visual trace of the resent message. This command sets a code in a utility debugging global. Notice that this page now includes the Show Query button; this button is shown only if the previously mentioned global is set. As noted earlier, some business operations might set the status of a failed message to suspended. Alternatively, you can manually suspend a message. Ensemble automatically places all Suspended messages on a special queue, shown in the Suspended Messages page of the Management Portal. You can use this page to determine why the message failed, fix the problem, and then resend the message. For example, if the problem is that an external destination went out of service, you can make a change to reestablish communication with that server. Then you can resubmit the suspended messages to the external server from this page. Or you can discard or delete the message. Error?  A quick overview of the results returned by the message to the business host that sent it. Source Configuration Name  The business host that sent the message. Select the messages by selecting the check boxes in the left column. Resubmit suspended message ID '7' completed. Any message that you resubmit retains the same Session identifier and transmits the same Header object. The description in the message header contains text indicating this is a Resubmitted message. Edit & Resubmit  Click this to edit a single message before resubmitting; this command is only valid if you select exactly one message. See the following subsection for details. Discard  Click this to remove the message from list on this page. The message is still accessible from the Ensemble Message Viewer, and its status is now Discarded. Delete  Click this to remove all record of the message from the Ensemble database. You cannot undo the Discard or Delete operations. Any message that you edit and resubmit retains the same Session identifier and includes the same Header object, but it contains a new Msg Body object with a new identifier. The description in the original message header contains text indicating that this message has been resubmitted and includes the original Msg Body object identifier. When you select one message to resubmit from the Suspended Messages page, you can edit the body of the message before resubmitting it. Click Edit & Resubmit to display the Ensemble Resend Editor page. Use the entry fields to update the message body data. The fields vary depending on the method signature of the message. If the method has no properties, none are displayed. If you are editing a virtual document message (HL7, X12, or other), you can edit data in the message content and also edit object properties in the box below the content box. Click Resubmit to resubmit the original message header with your edited message body contents to the target. After a successful resubmit, the page refreshes with text indicating the Header and Msg Body identifiers. Click Trace to see the visual trace of the resubmitted message.